One thing about having an apple tree in the backyard is that you will spend day after day obsessively thinking about things you can bake with them. What? That doesn't happen to everyone? I’m obsessed with the romance of it, just being able to walk into the garden to pick apples for that night’s dessert or morning’s oatmeal. We have a bumper crop this year, and every night there have been apples on our dinner table. It’s fall in Switzerland. It feels as though just last week I was sweating through my sundress in Paris, but suddenly I’m pulling my sweater a little tighter and reaching for a scarf to walk into town. The little chocolate shops in the historic old city of Bern are a welcome and warm hideaway from the winds blowing down from the mountains. This weather makes my belly ache with that back-to-school, first-day-feeling. That feeling of, “anything could happen this year.” When I was thirteen, I was consumed by the idea that it might be the year I finally got kissed. Little did I know it going to be the year discovered rodeo camp, braces, and middle parts instead. 11 years later, the weather still makes me want to live inside the fall J.Crew Catalog and go shopping for school supplies. I hope that feeling never goes away. I’m staying with my cousin in Bern, in the house where my grandfather grew up. Learning my family’s recipes is as much exploring a Swiss kitchen as my own story. And it starts with apples. Europeans have a very conscious culinary relationship with seasons. Cooking changes radically from one month to another by what is available and the way that fits the weather. Good ingredients are always the priority. With fruit alone, apricots steal the show in July, peaches in August, and Italian prune plums to open September. Now that the leaves are starting to turn, apples are everywhere and I’m craving food that is warm and comfortable. This tart recipe belongs to my uncle, Pascal. Less sweet than a traditional apple pie, its simplicity allows the apples to have the spotlight. The nut base adds just a touch of richness and flavor without overpowering the fruit. The ingredients are common things from the cupboard (no trip to the market required!). With everything at hand, it can be thrown together in minutes with the help of an apple peeler. On a cold night, a warm slice of this fresh apple tart is the perfect for topping off an "Oktoberfest" dinner, or simply watching BBC series while cuddled under a blanket with my cousin. As it turns out, Benedict Cumberbatch is a universal language. If you’re like me, slice another piece in the morning add a dollop of plain yogurt and call it breakfast. The nights may grow colder and I might have to buy a winter coat, but thank goodness the apple tree shows no signs of slowing down. To make the pie crust: Combine flour, sugar, and salt in a medium bowl. Cut cold butter into cubes, and add to flour. Work through with your hands (this feels weird and satisfying) until the butter and flour form coarse crumbs. In French cuisine, this is called “sablage’—now you know. Slowly add the ice water to the crumb mixture, working with your hands just until the dough comes together. Use the heel of your hand to knead the dough to help it take on a uniform consistency, but do not overwork. Once the dough forms a smooth ball, split it in two (that’s right! Two pie crusts! Because sharing is not easy when if comes to pie) and wrap each ball in plastic wrap. Place in the refrigerator to rest for at least 30 minutes. Preheat oven to 375 degrees F, 190 degrees C.
Once the dough is rested, lay a sheet of parchment paper on the counter (this is a trick from Swiss pre-made pie crusts… Why not? Make life easier for yourself). Place one of the balls of dough on the parchment. Using a rolling pin or clean wine bottle (we’ve all been there), roll out the dough from the center, rotating the pin or the parchment 1/3 with every roll to help make an even circle. Don't worry too much if your dough looks like Wu-Tang when you roll it out, this is a rustic pastry and I think it adds character. Plus, it means more scraps to nibble when you trim it... Once the dough is large enough to cover your tart or pie pan, the dough and parchment inside the pan. Press gently to into the edges of the pan. Helpful trick: use a small ball of scrap dough instead of your fingers to press the dough into the pan. Using scissors, trim the excess paper and dough to fit the edges of your pan. Peel and cut your apples to desired shape, and toss with lemon juice to avoid browning. 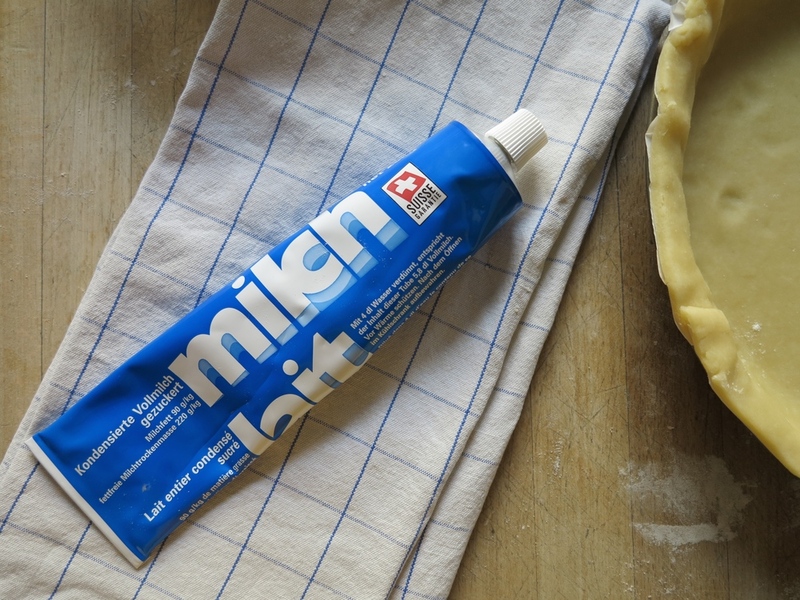 Spread or swirl the sweetened condensed milk on the bottom of your tart- it is the glue that binds your base together. Cover with a think layer of hazelnut meal. Sprinkle sugar (you can edit the amount for desired sweetness) evenly over hazelnut meal. Layer apple slices uniformly over the base. Pascal, for efficiency when we are demanding an apple tart and ASAP, uses an apple slicer and lays the slices in a spiral in the base. Once you have laid in your apples, sprinkle with a light dusting of sugar, brush pastry edges with heavy cream or egg wash, and pop the tart into the oven. Bake for 20 minutes and check, return to oven if needed until tart is golden brown. If crust browns too quickly, tent with tinfoil. Allow to rest on a wire rack before using the paper to remove from the tart pan. Or, you know, cut it and serve immediately with vanilla ice-cream and thank the blessed pie-crust recipe writers that you have a second one saved for tomorrow. A note for my mother close friends: there is no shame in buying a pie crust. I only ask that you buy or pick the best looking seasonal fruit that you can. End note: The Swiss, my hips have learned, are not afraid of sugar or fat. Full fat milk, full fat yogurt, creamy cheeses, creamy chocolates. If you have a mind, once the tart is nearly finished (about 20-25 minutes in) you can spoon over a mixture of Pascal’s invention: Butter, honey, a touch of cinnamon, and a dash of cream melted together on the stove. Then, return the tart to the oven and bake until a rich golden brown. The butter will help the apples darken faster. *For me, hazelnuts will always be synonymous with Swiss sweets, but any nut meal would work. When we run out of hazelnut meal, we use apples, almond meal, and cinnamon. You could also use pecans for a peach tart, walnuts for a pear or plum, pistachios or pine nuts for apricots… lots of opportunities to be creative (or get rid of nuts you bought for that trail mix you didn’t make) with this simple formula.